*To make sourdough sponge, remove your sourdough starter from the refrigerator and pour into a large, clean bowl. Feed it with equal quantities of flour and lukewarm filtered water (3 cups of each is often a good vigorous feed that will provide enough sponge for the recipe, as well as enough leftover to store for future baking). Cover loosely with a clean towel and allow to ferment in a draft-free spot for 8-12 hours before proceeding with your baking. Combine all ingredients in the bowl of a stand mixer. (Be sure that once you’ve measured out the required 1 1/2 cups of sponge for this recipe, you pour any remaining sponge into a large, clean jar and store in the refrigerator to be used as starter for future baking.) Using a paddle attachment, beat the dough until it’s smooth, stretchy and shiny and pulls away from the edges of the bowl — this will take 5-7 minutes. Scrape down the edges of the bowl as necessary, cover with a clean towel, and allow the dough to rise in a warm spot free from drafts for about 3 hours, until it’s very puffy. Turn the dough out onto a lightly floured work surface and gently roll it into a large rectangle, about 1/2 inch thick. 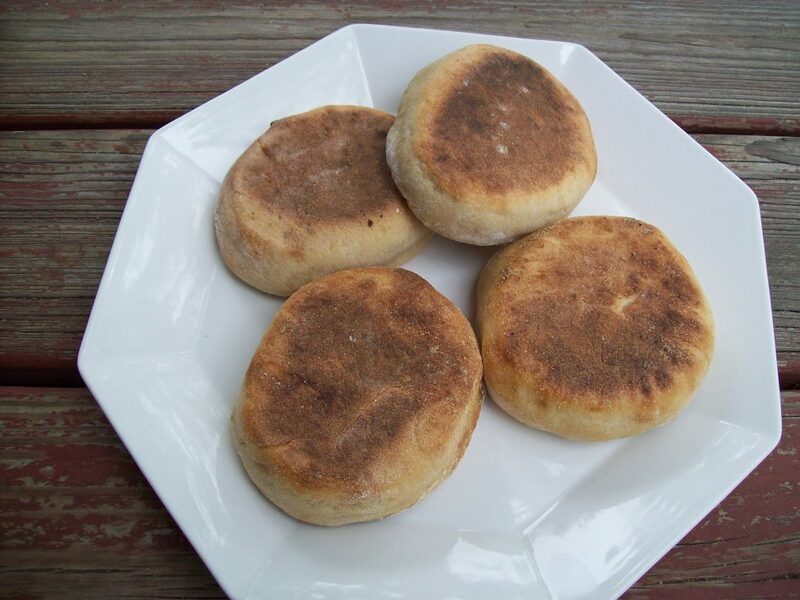 Using a large round biscuit cutter, cut out your English muffins — you should get about 14-16 muffins from this recipe. Preheat your oven to 350 degrees. Sprinkle two rimmed baking sheets generously with cornmeal. Place the cut muffins onto the cornmeal-covered sheets and allow them to rest for 15-20 minutes. Preheat a large griddle over medium heat. Brush the griddle lightly with butter. Working in batches, transfer the English muffins to the griddle — cornmeal-side-down — and allow them to cook for 5-7 minutes per side. The muffins will puff up while cooking. You may need to manage your heat a bit; this is a slightly finicky process, but not difficult. What you’re looking for is to have your muffins puff and become deeply golden-brown on one side before carefully flipping over. By the time the second side is browned properly, the sides should have begun to dry and should no longer feel tacky to the touch. Brush any excess cornmeal from the baking sheets. Return the griddled muffins to the baking sheets and pop into the oven to finish cooking through — you can cook your English muffins exclusively on the stovetop, but it’s more difficult and time-consuming to get them fully cooked through on the griddle without burning. Starting on the griddle and then moving to the oven is an easier way to get a more consistent result. Bake the griddled muffins at 350 degrees for 10 minutes. Remove from the oven and allow to cool completely. Remember to split your muffins with a fork rather than cutting through with a knife — that’s what gives the nooks and crannies!